is it a problem having butcherblock countertops near a sink? - I love the look and functionality of having the butcherblock top near the sink but have been told by contractors the maintenance will be difficult to keep up with and will look rotted in a couple years. Your experience? Designs by BSB, if one uses Waterlox in the e tire counter tops , what would be the maintenance for the counter tops? Thank you! Pretty simple - Wash with mild soap and water, and then rinse. Disinfect with a weak solution of vinegar and water in a spray bottle, if desired. Be sure to dry the top thoroughly. Do NOT use ammonia, chlorine bleach or 409 type cleaners on the Waterlox finish. Color of cabinets please? - Color and brand of the grey kitchen cabinets? In the background of this photo, it looks like there is a wood waterfall (partial waterfall) counter-top. Is that correct? Can you tell me about the wood that was used, the finish, and the hardware on the front panel? Thank you! Who makes the pendent lights? These lights are very interesting, and I think they work great in this kitchen. I love the dark wood with stainless steel. It seems like everything just fits so well together. are these pics for sale? This is great I love it! I love the light bulbs perfect fit for a cozy home. 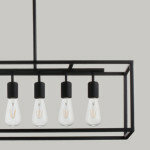 where do the pendant lights come from? Our house was built in 1987, our kitchen still is the same. But now my husband has MS and so my question is can a kitchen be made over for 25,000 that has wheel chair access? Before you embark on renovations...if you haven't done so already...please please please consult an occupational therapist (OT) to assist with universal design considerations. ADA cabinets designed by kitchen companies such as KraftMaid or architects may or may not work for someone with MS. Depending on the form and course of the MS, needs can vary. Some MS is so slowly progressing that the prognosis is excellent, or progression can occur quickly. Sometimes only legs are affected, sometimes only hands, or speech, cognition, etc. An occupational therapist is an expert on achieving optimal independence and function by modifying the environment and will have experience working with people with MS and other neurological diagnoses. Their recommendations are very individualized, as opposed to the more generalized recommendations of "universal design". Most insurance companies cover OT's, and may or may not require a physician referral. In my experience, staying and renovating is almost always cheaper than moving....unless downsizing significantly, e.g. an apartment or condo with good wheelchair access (which you could always renovate when the time comes). In my experience, the more large/open spaces the better! And depending on your husband's work and insurance plan, some of the modifications might even be covered or partially covered? Insurance coverage will be extremely important to maintain throughout. Power wheelchairs are incredibly expensive (as much as $25 000 in some cases!) but are so important for quality of life for some people who can no longer walk (and they are modifiable, unlike scooters). Some can even stand a person up! We just purchase a KraftMaid kitchen and it was quite affordable, all-plywood with solid wood doors (less than $9000 for a 12x11' room), especially if using laminate counters. If you stay away from particleboard, there is the possibility of modifying cabinets with a little help from a cabinetmaker. A big consideration is the location of where you are now. Is the neighbourhood accessible? Accessible parks nearby? Friends/neighbours. Friendships and family nearby obviously make life much more bearable with a diagnosis like MS.
Hope this helps! Take care. Ooops - just realized your post was from 3 months ago. I might be too late. Oh well, if it helps someone else reading, I'll just leave it there. Kitchen Faucet - Who manufactures that faucet? Wondering what designer chair this is? - The floral chair. Been seeing many replicas here in Manila. Please enlighten me. Thanks! Looking for chairs like this that are less expensive, have any sources? Where can I get the cabinetry - Where can I get this cabinetry and what is it called? what about the bedrooms for this house? what brand/type of cabinets are these? what is the material used for these cabinets? love them. Can the Architect confirm that this is Barren Plain? I agree with dwfrance, looks too dark for Barren Plain. Thanks. 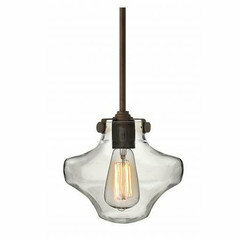 Where can I find pendant lighting like this? 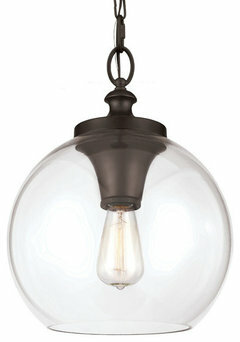 Lowe's has a great knockoff of these pendants right now. Do the pendent lights give enough light for a kitchen? I have done a cooktop under a window. It is great! Another issue is cooking spatter on the window. Size - What is the size of this kitchen? Yes what are the dimensions. I'd also like to know the dimensions of the kitchen and also the size/dimensions of the island. thank you! What colour are the kitchen cabintets? Beautiful, and the counters?? The grey tones are in right now. I don't know the color of these cabinets, but the line I carry Wellborn has a few shades. You can find them at http://www.wellborn.com/index.php?nav_id=97. Also you can come by my showroom in Orlando and see them. Could you please tell me the material and color of the cabinets? 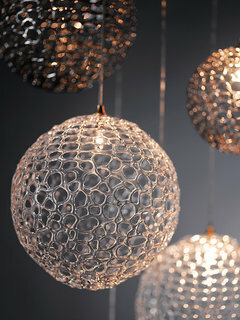 Where could I get thses lights, there are very beautiful and interesting. Thank you so much. I can't seem to pull it up on the BM website but I am assuming it is a warm white? Am hoping to paint my (diarrhea brown) kitchen cabinets a sophisticated gray.....anyone have an outstanding idea??? want to pair it w/ carrera marble and tourquoise as a pop.....scared to make a mistake...HELP ! What is the wood floor type and stain/color? How do the floors hold up in a kitchen? I have oak wood floors in my kitchen and they hold up great! Will be expanding the kitchen soon and am keeping the wood floors. What brand are these lights? Gorgeous kitchen and not seen before. 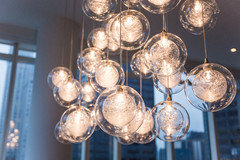 If you cannot find the source, you may like some of our lighting we make from blown glass. 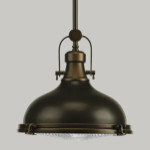 All custom made and can be made as individual pendants or multiples on a single canopy. Bar stools - Where to buy? 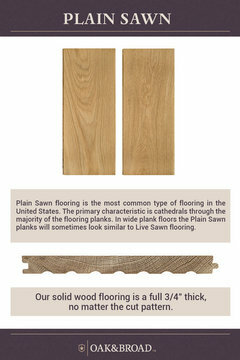 Urban Tree Salvage, based in Toronto, is Canada's leading salvaged live edge slab table manufacturer. We specialize in creating one of a kind tables in a variety of locally felled, salvaged hardwoods. Please visit our website for more information on our company www.urbantreesalvage.com or send me an email at melissa@urbantreesalvage.com to receive a quote and to view our current options. how much does this kitchen cost? - how much does this kitchen cost? I'm betting it's somewhere between an Ouch and an OMG i think I'm gonna faint. Where can I find the lighting pendants? Where are the cabinets ? If you click "more info" above and look under the picture, you can see all of the questions people have asked in the past about it and the answers others have given. My kitchen available open space is 7'10" by 9'. Is it feasible to install a center counter top with a sink and eating area, as shown in the picture? You need at least 42" all the way around a kitchen island - Then you'd need 24" depth minimum for the island cabinet and another 16" or so for an eating ledge: That adds up to at least 124"
@ bepsf - 124" of open space in the kitchen? Am I understanding this correctly? are all stainless appliances made of material that shows finger marks, spots, etc ? Yes, all stainless shows fingerprints, etc. No. Some manufactures are putting out a smudgeless stainless front. I think the GE line has it. I have a sub-zero (like the one featured in the phot) and the bane of my existence is wiping that thing down. What kind of cupboards are these? They look metal. Or are they painted ? They are painted - Valerie, the designer, chimed in when someone else asked this question and let us know that they are "a hard lumber paint grade Benjamin Moore Barren plain." If you click "more info" above and look under the picture, you can see all of the questions people have asked in the past about it and the answers others have given. A few other color experts chimed in with other suggestions if you have trouble finding the color the designer used. Sorry, I meant to also answer that they are wood and painted, not metal. 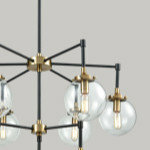 Where can I buy the pendant lights? Gorgeous kitchen! GIve Sherwin Williams' Gauntlet Gray, SW7019, a try. What kind/type of counters are these? There are a couple of shots of this kitchen in Valerie's uploads. You can see the counters more clearly in some of the other photos. However, there are three counter materials at work here. The perimeter and island counters are Indus Gold Limestone, there's a maple wood top over by the window and the table top is another wood. What's the support at the lunch counter? It's stainless? Great floor. - What is the colour and type of floor? It looks like site finished Plain Sawn Oak flooring. Why is there no answer to the cabinet color question? What is it? where can i find fabric like the one on the chairs at the bar? My kitchen is so tiny and I love to cook so much that I have to keep lots of my pans, etc. in the basement!! Needless to say, that means, I don't use a lot of my pretty things. Have you thought of maybe a decorative rack so you can have the nice ones close by? I have a rack of pots and pans in my basement too! i have a small kitchen can this be done on a small scale? My guess is that you can certainly use the same elements, but edit down the amount of counter, cupboards, etc. I think islands are the toughest bet with small spaces, but you can certainly maintain the same feel on a small scale. Where can I find the lower kitchen table? I think it's Blanco Culina. It's a little hard to see for sure but I have this faucet and it looks exactly like mine. The Culina is a thing of beauty... I love it! Just be sure to remove the flow restrictor if you get it, otherwise, the water flow is ridiculous. Once you remove it however, it's perfect. What brand is the refrigerator? Is it a Sub-Zero, Thermador, or Viking? I can't tell from the angle of the photo. Thanks for your time. If you click "More Info" you can actually see that a handy little green product tag has been added to this fridge to help you out. It's a Sub-Zero. what is the backsplash material -- is it a large scale tile? It's not tile - it's travertine slab, just like the counters. Where to find the chair fabric-lovely! Here is the chair link....if u click "more info" under the pic you will see that it is tagged. Cabinet paint color - can anyone confirm the paint color of the cabinets? And are the colors still available? is the island it custom made? - I am interested in the design of the island. How can I achieve that design? What is the white paint color used on the walls and ceilings ? What's the dimensions of the island incl. the live edge eat table? What's the countertop material? Is the backsplash the same? Island - The kitchen island with the drop table for eating-does this style have a name? Love it! Any idea what color the cabinets are? Are Beadboard ceilings suppose to be seamless? - It seams like all the pictures of Beadboard ceilings in the kitchens are seamless.what if you purchase all the boards one length and not long enough to reach across without a seam? Like the bi level island with lowered eating area. - How did you prep the wooded eating area to protect it from the elements of food and beverage? Cabinet hardware - What manufacturer/name of the cabinet hardware? Fabric on chairs - Can you tell me where to find the fabric on the chairs in this photo? Thank you! Dimensions - Length of outside wall, oven wall and dimensions of island, please! Island table - Is the island table freestanding? Is it removable? Island and backsplash? - What's the island and backsplash material ? Where can I find those stools? What laminate is the cabinet - What is the color for cabinet laminate? Question about the vent-hood and countertop? - I love everything about this kitchen. Can you tell me the brand of the stainless range vent hood? If you know the model number that would be helpful. Also, what stone is countertop made from? Wall/ceiling color? - My home is similar in grey and the wood color. I would like to know your wall-ceiling color used. I am purchasing paint this week and would love to know soon. THANK YOU! Paint color - What color and brand of paint was used on the cabinets? Wheresurbelly - What size hardware? Fridge - Is this with the stainless panel on the door instead of ordering it in stainless steel. In other words, did you order the panel ready fridge and then have them put stainless so it didn't stick out as much? Paint color. - What is the blue paint color? After working/living in the space, how has the limestone held up? who made the wood table with stainless steel legs? Countertops? - Is it just wood? Zach - Were the cabinets painted that grey color? Is that the original color of them? If not would it be hard to paint them that color? What is the wood and finish on the floor? 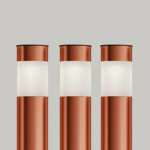 Light Fixtures - Who makes these light fixtures and what is the name of them? Thank you. Where to get lower level of counter top from, wooden table kind? Kitchen Cabinets - Who manufactured your kitchen cabinets? Thanks!!! What is the counter top material? - Is that travertine? What is the color of the cupboard? how tall is the ceiling ?? What paint was used on the ceiling? Can you please tell me the dimensions and manufacturer of the range hood? Is it 10" undercabinet or 18" wall? A lowered island counter lets these standard sized chairs serve as very stylish low barstools. In this kitchen the colors are reversed, with the cabinetry painted a gun metal gray while the backsplash, countertops and lighting feature golden tones and finishes. The kitchen was opened up to the rest of the home and contains a small hidden desk area for the kids where they have their own Mac. (This keeps them away from Mom's.) In fact, it's so concealed, you cannot figure out where it is from this picture; pocket doors hide it and it's on the left side. 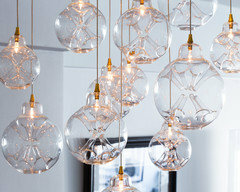 The light fixtures are by Lindsey Adelman. The Mademoiselle chairs are by Kartell and are covered in Missoni fabric. The integrated table provides an unexpected but pleasant variation in materials and the counter's elevation. The Mademoiselle Chairs by Kartell work with this design because of their straight lines and because the room's color palette exists within the fabric pattern. Enjoy multipurpose furniture. Valerie Pasquiou, who I absolutely adore, considers how each piece contributes to an overall aesthetic. And in the process, she has created a kitchen and dining space in one. Using furniture for dual purposes eliminates the need for superfluous materials in your home. Have a fairly neutral kitchen that feels drab in winter? Add brightness with a set of chairs finished in colorful upholstery, like the beautiful Mademoiselle Chair by Kartell. 1. 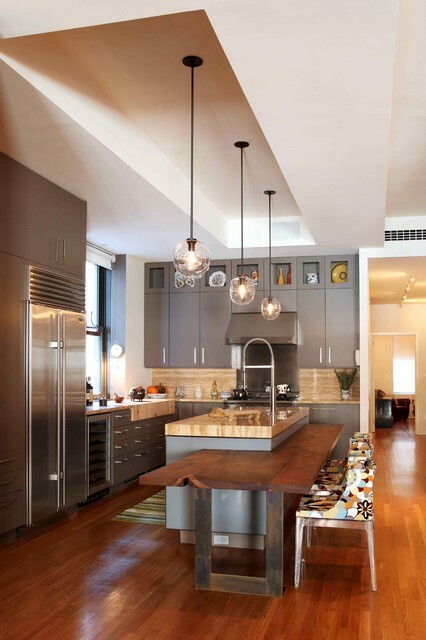 This New York kitchen was added to many ideabooks for its unique mix of texture and color. Matte gray cabinetry, industrial light fixtures, maple work surfaces, and a steel and exposed wood drop-down table all play into a natural color palette, while classic Kartell Mademoiselle Chairs add a pop of color and pattern. 5. A mix of materials, shapes and scale. One of the biggest telltale signs of a contemporary kitchen is the use of multiple, layered materials with lots of pattern and texture. Modern kitchens tend to be more restrained and lack ornamentation. Here we have various types of wood and stone, shifting planes of countertops, round lights contrasting the rectilinear elements and even some pattern in the fabric on the chairs. Keep in mind, when mixing many materials and tones, it’s best to pick some themes to repeat to create a sense of harmony, such as using multiple shades of wood or sticking to only neutrals. When in doubt, wood, metal and glass make a classic trio. Drop down ceiling with elevated lighting to replace the California ceiling plastic grids.